The Hooray Cardigan, that is. Bringing the blog back to life with a brand new sweater. 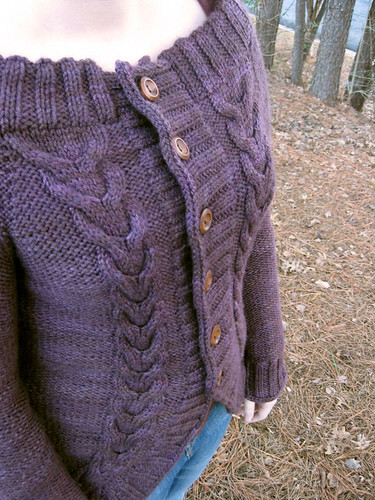 I found this pattern while browsing on Ravelry and was instantly intrigued by the charming rounded fronts. It makes the whole sweater seem softer and cozier. I worried that it would draw attention to my wide hips, though, so back in the queue it went, until the day Lindsay* showed up to work in a very similar sweater. I had to have it! And this was a wonderful knit, in no small part because the yarn, Fleece Artist Blue-faced Leicester Aran, is dreamy. It’s squishy and soft and huggable. It slides across the needles and knits up quickly into a sweater you can not wait to wear. And the color! To be honest I’m already scheming to knit another sweater in this yarn; I really enjoyed it that much. *Do you all know about Lindsay? I blogged about hiring her but the blog died shortly after and ate the post. Lindsay works here, doing most of our shipping and customer service and a lot of other things too. This place would not even function without her! If you’ve ever sent us an e-mail or placed an order, she’s probably helped you out. Are you there blog? It’s me, Erin. You all probably didn’t know this, but the blog broke again. In this very weird way where you could still see the posts but we could not even log in to it, look at comments, make posts, etc. I didn’t want to take it down because I know people use some of the posts for instructional information, but I also could not post to alert anyone that I couldn’t post! Very troubling. But now it is back, thanks to my trusty husband/webmaster, so look for posting to resume shortly and we’re so sorry!